The relentless pursuit of technological advancement since the World War II has given the global community inventions like mobile phones, modern cars and television. A lot of thought has been given to the individual commodities that enrich the modern world, but much less is afforded to the simple invention that made it all accessible. That's why a new exhibition at the Australian National Maritime Museum in Sydney is highlighting how shipping containers have helped change people's lives. Prior to 1956, all cargo was transported via break bulk shipping, a tedious, painstaking process which involved loading and unloading a range of oddly shaped bales, bundles and crates. While watching scores of workers unload an army of trucks as he waited for hours on end, a 24-year-old truck driver Malcom McLean came up with the idea for a universally sized, stackable box that did not need to be unpacked, at the port of Newark in New Jersey during America's great depression in 1937. At the age of 40, McLean borrowed money from Citibank in New York and in 1956 his first container ship, the Ideal X, sailed from Port Newark to Europe with 58 containers on board. For an individual truck, the new system would save the driver around one whole day each time they would arrive at port to unload, but overall the ship's workers would save more than one week on each end of the voyage. The simple invention meant ports could increase exports exponentially at a rate that was completely unimaginable just years ago. "Containers have this really special role in our lives that not many people know about," Dr. Mary-Elizabeth Andrews, curator at the Australian National Maritime Museum, told Xinhua recently. "Shipping is the global driver... in terms of the way you and I live our everyday lives." "Without the container we just wouldn't have the phones that we use everyday, we wouldn't have our widescreen televisions, we wouldn't have access to cheap fashion, cheap furniture or the kind of level of lifestyle that we're used to." Once dominated by Europe and the United States, the world's leading seafarer is now China, after overtaking the Americans back in the early 2000s. Not only does China now manufacture 90 percent of the world's containers, but also Chinese ports handled 195.9 million containers last year, cementing their position as the world's most significant shipping hubs. Outside of freight, used shipping containers are now being transformed into postmodern homes, breathing new life into the simple rectangular box. 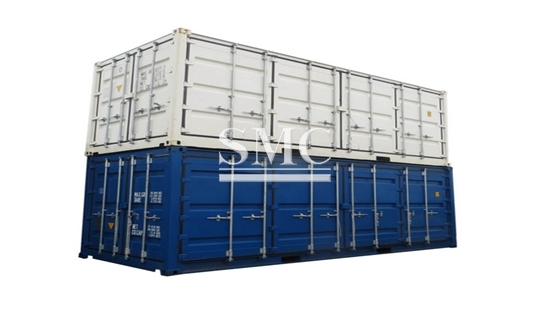 "The active life of a shipping container is 15-20 years," Andrews said. "They're made out of steel, so you can recycle that steel, but that is a very energy hungry process." "So one of the really great ways of utilizing that material is to repurpose it." Builders around the world have been experimenting with environmentally friendly, cost effective designs that are proving the used containers to be a viable alternative to traditional housing. In Denmark for example, an entire housing complex for students was developed using floating container ships on a canal. "The architects and designers today are coming up with such great solutions that it's no longer this idea of just a square box," Andrews said. "Their creative solutions are quite amazing." The new breakthrough in world shipping is China's reimagining of the ancient Silk Road trading routes. The Belt and Road Initiative launched in 2013 aims to further strengthen the land and sea infrastructure networks that connect Asia with Europe and Africa. Much like McClean's idea 80 years ago, the initiative plans to improve efficiency and give people more access to goods across the globe.